Description:Used for scarfing flat oval reed. Description: Metal tie-on with wire & pip berry. Description:Bowl used as a mold. Description:100 cable ties (4" long). Great for rims! 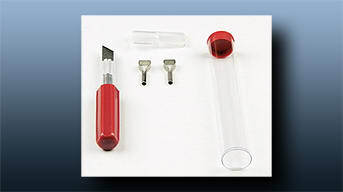 Description:Red/white soft handled cutting scissors. Description:Set of 4 wood button feet. Description:Medium thick glue to set in stakes to base. Description:Extra thick glue to hold stakes into base. Description: Used on "Patriot" basket. Item: Rusty Tin Bow 2in.